Marital Status: Married to steeplechaser Martin Yelling. 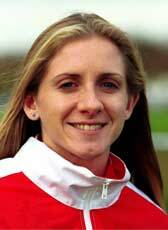 Liz was 2nd in the AAA Juniors and won the English Schools 1500m in 1993, when she also ran for the British junior team. She was third in the CAU and had second places at the British Universities and UKs, but missed most of the track season. Liz was 3rd in the National cross-country, but missed most of the track season. Liz won the Reebok Cross Challenge series and, with an individual bronze, helped the British team to the team gold at the World Students cross-country, going on to her best season to date on the track. She was 3rd in the National Cross-Country, a week after running for Britain in the Chiba Ekiden road relay. She then came in as a reserve to run in the World Cross-Country Championships. After a steady track season she ran brilliantly at Velenje to place 4th in the 1999 European Cross-Country Championships. She was runner-up at the World Cross-Country Trials and was then Britain's second scorer in 44th place in the World 8km race. She ran a personal best of 26:09 to win the Hillingdon 5 Miles in March, and made her 10,000m track debut in the European Challenge, 24th in 33:11.84. She improved that to 33:07.9 for 8th at the AAAs. She took over two seconds off her personal bests for both 800m and 1500m, and at 3000m won for England against France. In October came her best performance of the year as she won the Stroud half marathon in 72:31 (compared to her previous best of 75:06 from 1998) and she earned a team silver medal when she was eighth, Britain's second finisher, in the European Cross-Country. Liz was a clear winner in the CAU/Trials race, had a 27-second winning margin to take her first National Cross-Country title and had her best ever run at the World Cross-country Championships. She ran personal bests for 3000m in July (9:08.13 and 8:57.3) and with 4:15.01 for second place in the AAA 1500m. She was then 4th in the Great Scottish Run, half marathon with a PB 72:26 (winning the UK title) and was 4th in the Cheltenham 10km race (2nd AAAs) in 33:20. She then took another 57 seconds off her best for 23rd place in the World Half Marathon. She was a clear winner of the Reebok Cross-Country Series in 2001/02 when gained her fourth top ten place at the European Cross-Country Championships, leading the British team to the silver medals, and won the UK and national titles before another fine run with 18th at the World Cross-Country. She left her job as a part-time maths/PE teacher to become a full-time athlete in December 2001. As the athletes passed the finish for the first time (after 800m) in the Senior Women's four lap race Paula RADCLIFFE, Liz YELLING, Kathy BUTLER and Hayley YELLING were all well positioned in the main pack. By the end of the first full lap a group of about 15 had broken away with Paula and Deena Drossin leading the way. By the end of the second lap Paula had broken away with three other athletes including Drossin, with Liz, Kathy and Hayley all retaining positions in the top 30. By the end of the third lap Paula and Drossin had broken away and Paula began to open up a lead going into the fourth lap and ran strongly to pull away from Drossin and Colleen De Reuck who led the USA to a team Silver medal. The Norwich Union GB Team finished fifth in the team competition and first European nation with 69 points just two points behind Japan in fourth (67points). "My legs had gone after two laps, I was just hanging in. I am pleased though. On that type of course I wasn't sure how I would fare. I would have preferred mud as the pace is just so much faster on the type of course we had today. The finish straight was a real grind, you couldn't really kick. The Americans did really well, but when we saw the team we knew they would be strong." On the track in, Liz took over 40 seconds off her 10,000m best when 7th in the European Challenge race in 32:26.53 and ran a personal best of 15:45.08 for 4th at 5000m at the Commonwealth Trials and took over 28 seconds off her personal best when 4th in the Commonwealth Games 10,000m in 31:58.39, was 20th at the Europeans in 32:44.44 and was easily the fastest British woman in the Great North Run half marathon when 8th in 71:42. 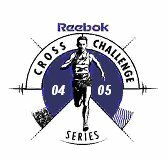 Liz won the Liverpool cross-country, her ninth successive win in Reebok Challenge Series races, but was then fourth at Margate, suffering the after-effects of a cold. Not fully fit, she was 30th at the European Cross-Country, but was Britain's third finisher and earned a team bronze medal. Returning after viral problems, she was 2nd in the CAU Cross-Country and third in the overall Reebok Cross-Country series before an encouraging run at the World Cross-Country when she was 19th (fifth European) in the short-course race. She ran 32:22.21 for 7th in the European Challenge 10,000m. An Achilles injury held her back, but she was pleased with her second in 33:37 in the London road 10km in July and improved to 33:02 for third at Tilburg, while preparing for her marathon debut in Berlin. Everything went to plan in Berlin as she clocked 2:30:58 to secure the Olympic qualifying time. 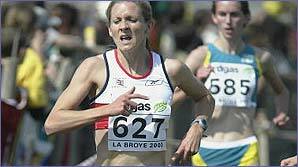 She ended 2003 with a solid eighth place as the Norwich Union GB Team took Gold at the European Cross Country Championships. Liz Yelling (864) was 13th in the Senior Women's Long Course 8km race at the World Cross country on Saturday in a time of 27:34. Great Britain took the Team Bronze medals with 74 points. She ran a personal best for the half marathon of 70:00 as pacemaker at the London Marathon, a dangerous decision with Olympic qualifying looming, and her own place in the marathon being far from sure.
" I've been planning for Athens since the Sydney Olympics four years ago. I run the 10,000m and cross country, but it's the marathon you'll see me competing in. "My training partner is also running in this event - the one and only Paula Radcliffe! I met her at my running club when I was 11 - she's a year older - and we just gravitated towards each other. We became really good mates. We did everything together - trained, swam and going out in the evenings. Paula and I share the same coach - Alex Stanton. "The marathon course is a really hilly one though! Paula's been out there and even filmed the marathon course. We both know what to expect. I enjoy the pain. The harder the race is, the better I am." "Cross country was always my favourite event at school. I just love it. It's the pain I enjoy! The tougher the event, the better I get! I was built with mental toughness and it's just been unleashed in athletics. And, of course, I adore getting muddy. I'm also a long distance track runner but it's definitely more fun competing in the fields. It's amazing running through the countryside with the wildlife, the trees and being away from the traffic. It's a great way to escape! I get bored quite quickly, but these races are never ever dull. The terrain is always different, your speed varies all the time and I get great pleasure watching my competitors struggle. It's obviously hard work to get to the top and if there's one person who's shown the way, it's my friend Paula Radcliffe. I'm a full-time athlete now but when I was teaching I was running at six every morning. Not very nice! The trick is to find a reason for climbing out of bed. What I do is think about my competitors getting up early and being fitter than me. It's just something you've got to do if you want to be one of the best. But just remember, however serious you take your running, cross country is one of the most fun races you can ever do. If you want to know where to try cross country then look for your local club on the UK Athletics website in the 'clubs' section. You'll also find out when the clubs train and how to get there. Get to it now! I might even see you out in that mud one day." Pre-race: The main contenders are likely to be sisters-in-law Liz and Hayley Yelling, both stalwarts of the GB Cross Country Team over the last few years. This will be Liz’s first race since finishing 25th in the Olympic Marathon in Athens. Hayley, who narrowly missed out on qualifying for the Olympics at 10,000m, ran the second fastest leg at the National Road Relays last weekend and was Reebok Series Champion for 2003-04. Liz Yelling was third in the Senior Women's race at the Reebok Cross Challenge race in Birmingham. The most convincing winner of the day was Hayley Yelling (Windsor Slough Eton & Hounslow) who led from gun to tape and won by 31 seconds in 22:16 from former European Junior Cross Country Champion Charlotte Dale (Invicta East Kent AC) with Liz Yelling (Bedford & County AC) a further nine seconds back. Liz was to the fore with Hayley in the early stages of the race, but she was unable to stay with Hayley’s pace and was then overtaken by Dale early on the second lap of the two lap race. Liz Yelling admitted after the race that she was "not fit by her standards”, having taken her time to get back into training following her 25th place in the Olympic marathon. She will miss the rest of the domestic cross country season as she and husband Martin are going on a two month training and racing trip to Australia on 14 November before a six week stint in Colarado, USA, from the end of January. “I hope to compete in the World Cross Country Championships and then run a spring marathon in London, Paris or Rotterdam,” said Liz. Olympian Liz Yelling (Bedford and County AC) breaks into her training for the Flora London Marathon to aim for her third IAAF World Cross Country Championships medal with the Norwich Union Great Britain and Northern Ireland Senior Women’s Team in St Galmier, France, on 19 and 20 March. And she believes she is not the only member of the 8km team capable of bidding for a place in the top 10 as they seek to repeat – or even improve upon – the Team Bronze medal won 12 months ago at the World Cross Country Championships in Brussels. “I would have been looking to do a race at this point before London and I’ve always been planning to do the World Cross this winter. If it was not the World Cross, it would have been a road 10km and I would much prefer the World Cross. Liz, who clinched the 8km Bronze medals for GB in 1998 and finished 13th last year, says of Saturday’s race: “I would like to place in the top 20 again but the aim is to come on and aim for the top 10. And I’m sure I won’t be the only one with that target.